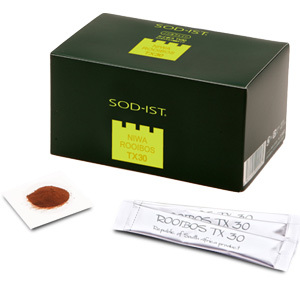 Rooibos TX is a powder extract, and is seven times the normal strength of Rooibos tea. Rooibos TX is a high-grade product that is rich in minerals and caffeine free, which means you can freely enjoy this delicious and soothing drink at any time. Warmed by the rays of the South African sun, Rooibos tea grows only in the vast Western Cape plateau region that stretches as far as the eye can see. It is no surprise that this beautiful landscape would be the birth place of this marvelous tea. The aromatic, soothing and unique rich flavour of Rooibos tea is only surpassed by its health benefits and healing properties. Rooibos tea is a South African tradition that has been passed down for generations. Classified as a coniferous tree, with the scientific name “Asparasus Linearus”, although locally it is more affectionately known as “a blessing of the red bush”. Rich in anti-oxidants, low in tannin and caffeine free it is one of nature’s perfect achievements. Protein, fat, plant fiber, carbohydrate, sodium, phosphorus, calcium, potassium, magnesium, zinc, manganese, quercetin, moisture, mineral, tannin and superoxide.